You can make a significant impact on the lives of individuals in the Dallas-Fort Worth and Rochester, NY areas as a partner of Helping Hands and Caring Hearts of America! Your tax deductible donation will go directly to a scholarship fund for college bound minority high school seniors coming from low income backgrounds and for volunteer teams to make a difference in the Dallas-Fort Worth and Rochester, NY communities. You can also partner by purchasing My Huggy Bear, a publication of Helping Hands and Caring Hearts of America, with all purchases going directly to fund scholarships for two (2) minority high school college bound seniors coming from low income backgrounds. My Huggy Bear will make an excellent gift for any child – and an excellent gift of education to a college bound senior! Helping Hands and Caring Hearts of America needs you to help out our scholarship recipients complete their volunteer hours with our Team! Teams will work in the Dallas-Fort Worth and Rochester, NY areas a few hours each month. Come join our Teams and make a difference in the lives of the people in your community! 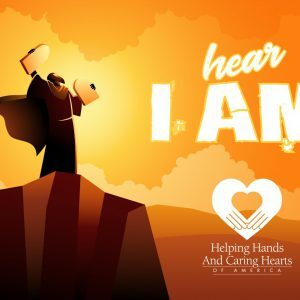 You can also partner by purchasing one of our new t-shirts in two designs: “Hear I Am” and the Helping Hands & Caring Hearts of America logo.